Braised short ribs are the perfect solution to a family dinner as they can be made in a huge pot and left for hours unattended. There is almost no such thing as over cooking (in fact, the longer they cook the better) and don’t required many finishing touches so you can enjoy all of the margaritas and conversations you want without worrying about them. Plus, they taste AMAZING and you get a million compliments with not a ton of effort! Before you start, I need you to remember a few things before you start. Memorize, visualize, and commit these to heart. 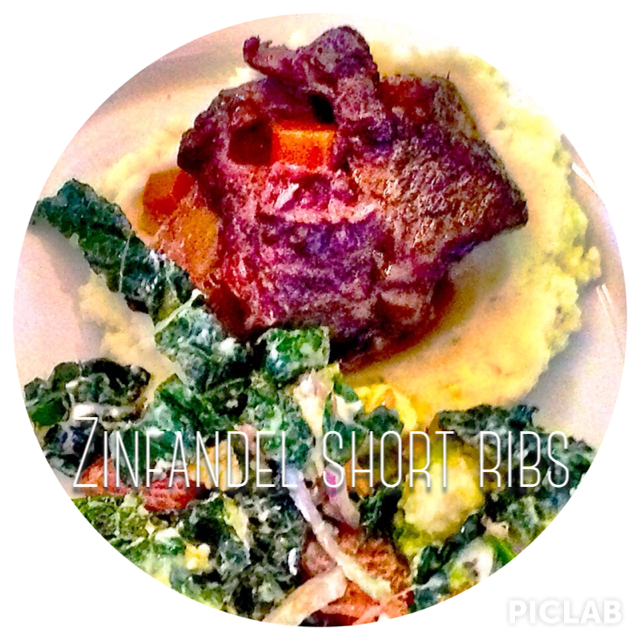 All of these things will help you perfect your short ribs! 1) ROOM temperature meat: helps cook everything evenly! Got it? Pretty easy. But absolutely necessary for preparation! Ok, now we’re ready to start. 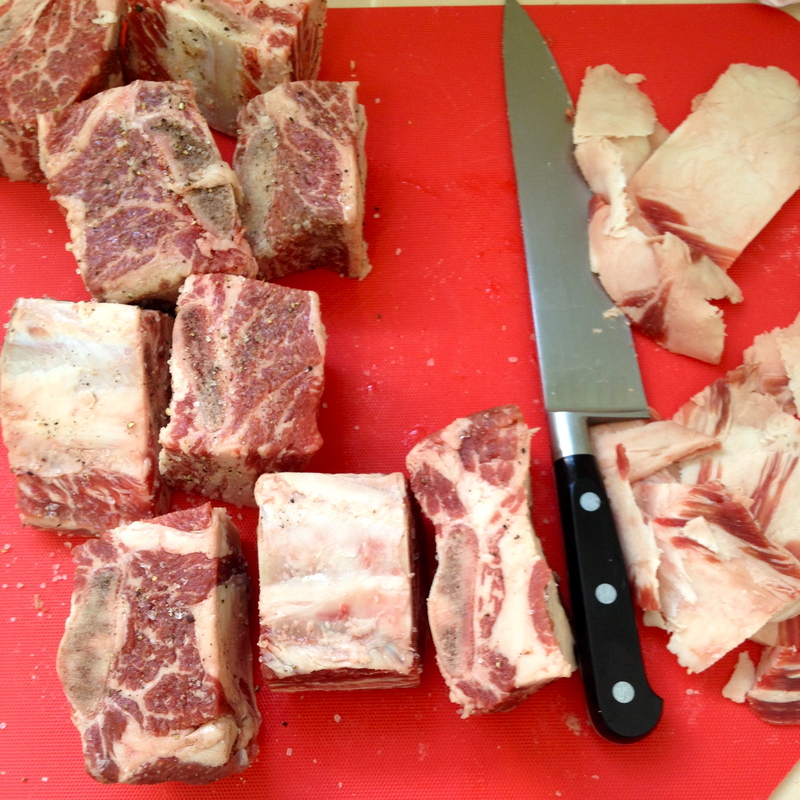 Using ROOM temperature meat, trim off all fat and cut ribs into individual pieces between each bone. Salt & pepper generously. Don’t they look pretty? In a BIG (remember the 7 1/4 pot?) 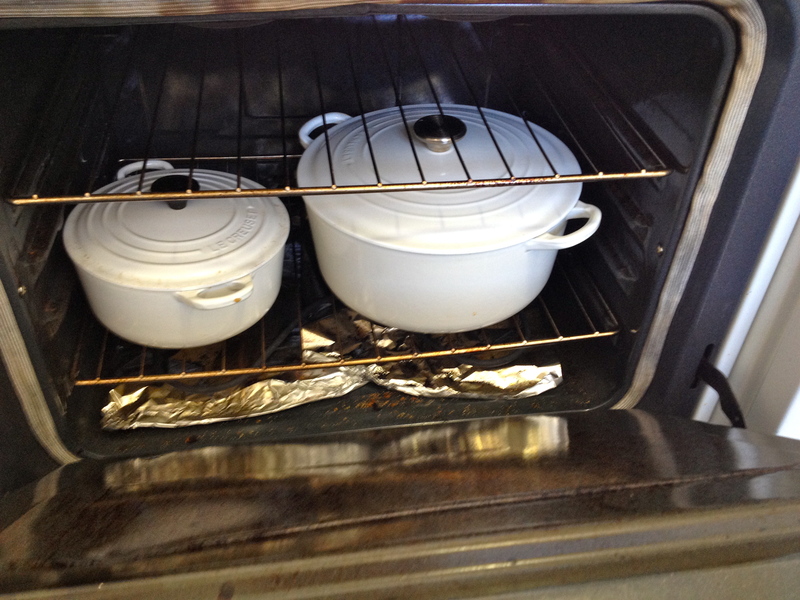 oven-proof pot, heat grapeseed oil and butter on slightly higher than medium high heat. Your pan should be HOT, smoking, and the butter should be turning brown. When you add the meat, it should sizzle and smoke. Like this! Sear meat on each side, about 4-5 minutes each and browned on each side. DON’T crowd your pan when you do this. Leave meat enough room between pieces to let air flow. You will likely need to do this in 2-3 batches. Remove from pan and leave on a large plate. Reduce heat slightly and add onions. Saute for about 5 minutes. Add carrots and saute 4 additional minutes. Add celery and saute 4 additional minutes. Add a few splashes of the red wine, let it boil slightly, and scrape the bottom of the pan with a wooden spoon to mix in all of those little flavor bombs stuck to the pan. Then, add remaining wine. 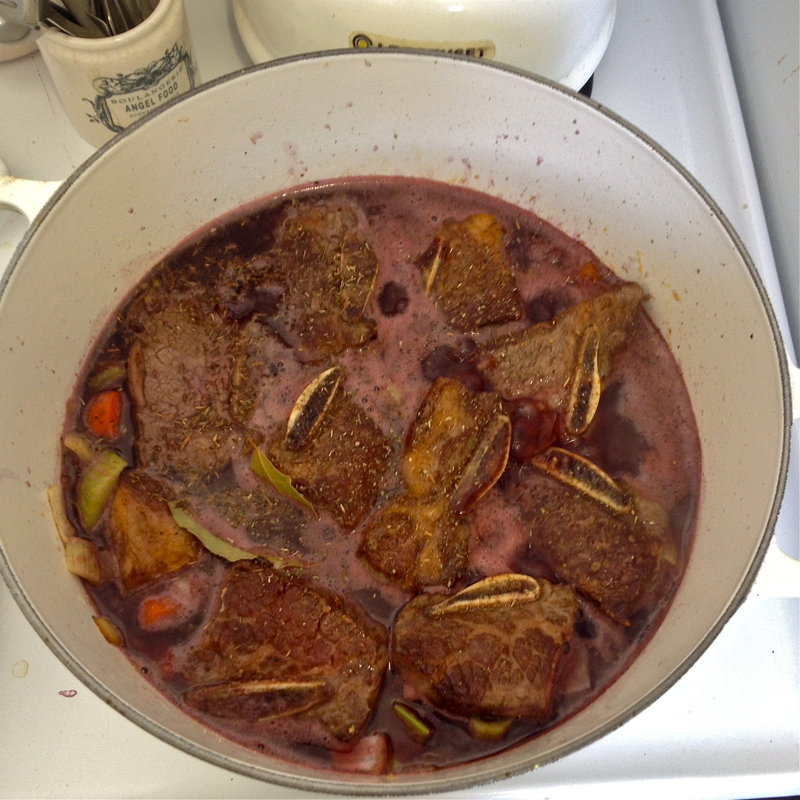 Add back the short ribs and all juices that have collected on the plate IN ONE LAYER. If you don’t have enough room, bring out another pot as crowding the meat will not allow all the happy juices and veggies to soak into the meat. Add all herbs and beef broth until meat is just slightly covered. 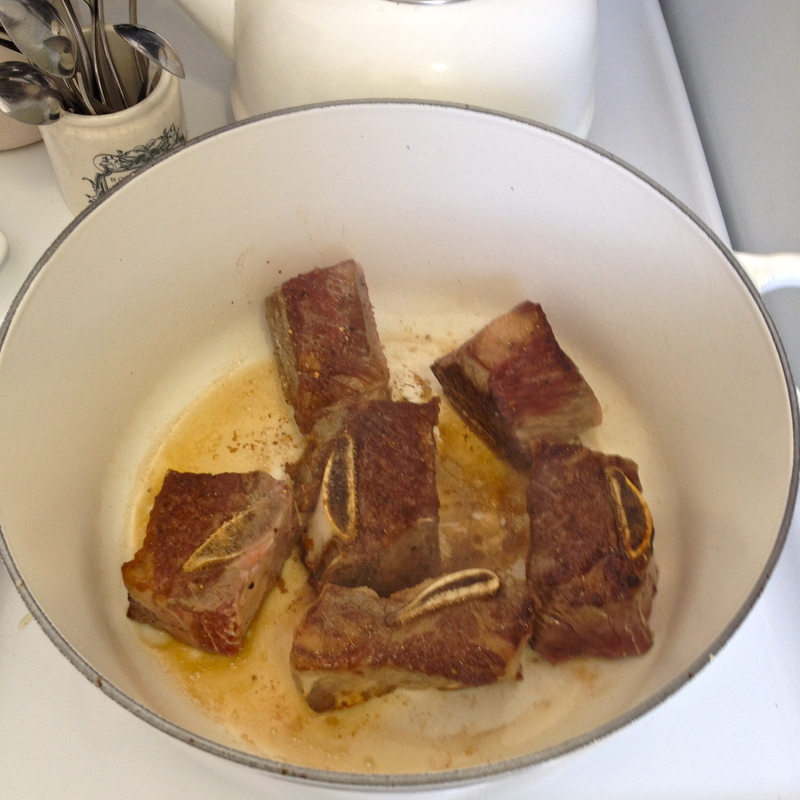 Cozy little short ribs IN ONE LAYER just before they are covered in the beef broth. Cover and bake in a 350 degree oven for 1 1/2 – 2 1/2 hours until meat is extremely tender and easily falls off the bone. Mommy and Daddy size Le Creusets ready for their 2 hour roasting. I used two as I cooked about 7 lbs of short ribs. Remove from oven and skim off layer of fat. Add S&P to taste and remove bay leaf and rosemary sprig. These are best served over the mashed potatoes from above. Mashed Potato/Potahtoe Variations: I chose the Rosemary Pureed Potatoes as the rosemary pairs well with the heartiness of the meat. 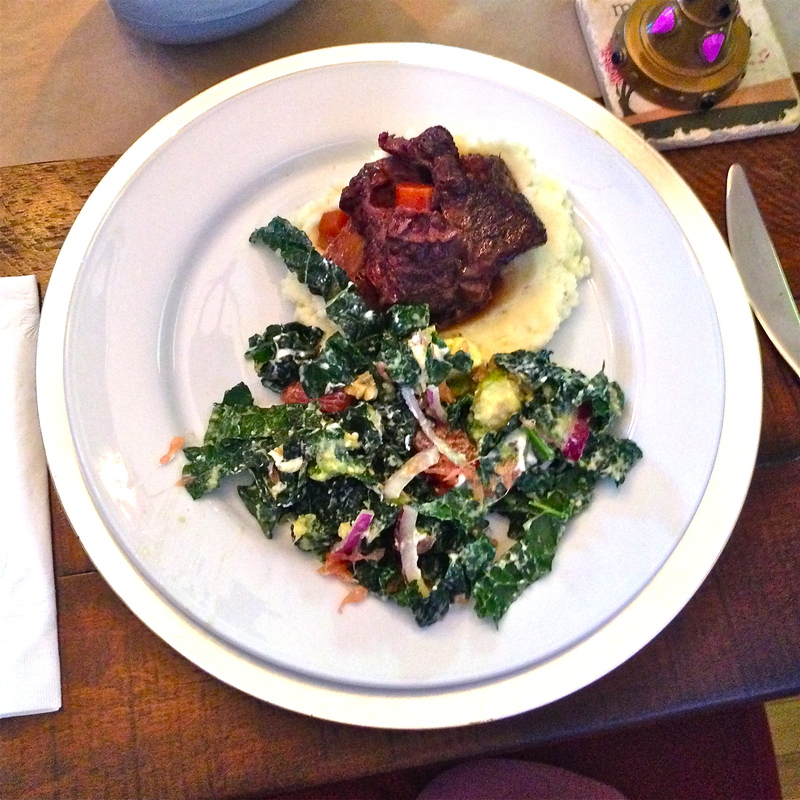 Sarah’s Kale Salad:Thanks to my friend, Sarah, for the recipe!